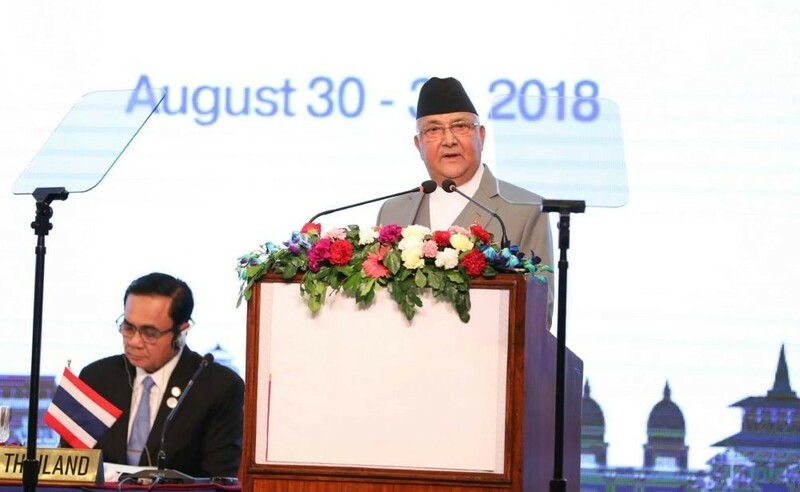 Nepalese Prime Minister KP Sharma Oli has stressed the Bay of Bengal Initiative for Multi-Sectoral Technical and Economic Cooperation (BIMSTEC) state members should accord top priority to take the people out from the clutches of poverty. He said the BIMSTEC state countries are facing the risk of terrorism, organised crime, drug smuggling and human trafficking and underscored the need of unity among its member states to defeat terrorism. He added the BIMSTEC members should enhance cooperation to combat all kinds of crimes. Saying that Nepal is the birthplace of Gautam Buddha and land of peace and harmony, Oli said the country needs support of international community to make prosperous Nepal and happy Nepalis as the country has already been blessed by wisdom from its ancestors. He said that prosperity is one of the keys to make people happy. “People are the drivers and beneficiaries of the connectivity and Buddhism is the source to connect the BIMSTEC countries,” he said. The Prime Minister said that faster development of social justice is the key to establish peace in the country and peace and stability are the major factors to uplift the country. At the summit themed ‘Towards Peaceful, Prosperous and Sustainable Bay of Bengal Region’, PM said all the state members of BIMSTEC are connected with Buddhism in one way or the other. He underscored the need of developing and operationalising a Buddhist circuit in the region to promote connectivity and tourism. He further said that the agreement on trade in goods, trade in services, investments, mutual assistance in customs matters, dispute settlement and trade facilitation signed among the seven countries should be effectively implemented to take the BIMSTEC ahead. PM Oli, who is also the co-chair of newly formed Communist Party of Nepal, said that the BIMSTEC state members have dynamic political permeated with the creativity ingenuity and diligence of our people, opulence and generosity of the nature, richness and depth of the civilizations and magnificence of diverse cultural and heritages. Highlighting that investment on youths is investment for prosperous future, he called for greater investment on youths. He made it clear that Nepal is for meaningful regional partnership and SAARC and BIMSTEC are not alternative but supplement to each other. He underlined intensive investment in transportation, energy, tourism and technology to connect all the BIMSTEC state members. "We want to achieve the goal of prosperity and happiness within a democratic framework established by our constitution and on the strengths of uniquely successful peace process", he said while expressing commitment to democracy, human rights, good governance, rule of law, and social justice. Speaking at the plenary session of the summit, Indian Prime Minister Narendra Modi said the member countries of BIMSTEC not only have diplomatic relations but are strongly connected by civilisation, history, art, language, cuisine and shared culture. The Indian Prime Minister expressed his commitment to establish Centre for Bay of Bengal Studies at the Nalanda University for the research of art, history and marine law among others. He said that India will organise International Buddhist Conclave in 2020. “I invite all the BIMSTEC state members to attend the programme as guests,” he said. Modi further said that India is committed to expand its national knowledge network to Sri Lanka, Bangladesh, Bhutan and Nepal in the field of the digital connectivity. The Indian Prime Minister expressed his willingness to organise a conference related to drugs in the BIMSTEC framework, saying that there is no country in the region that has not dealt with the problem of terrorism and drug smuggling. Likewise, Prime Minister of Bangladesh Sheik Hasina has said that the prosperity of BIMSTEC member states was possible through reforms in politics and economic situation. She underscored the need of development and expansion of security, tourism, energy and connectivity to lift the people of BIMSTEC state members out of poverty. Similarly, Bhutan’s Chief Justice and Chief Adviser of the Interim Government Lyongpo Tshering Wangchuk said that common efforts were imperative to combat the impact of climate change. “Climate change is the common problem of this region, common efforts were essential to cope up with it,” he said while speaking at the plenary session of the summit. Apart from Oli, Modi, Hasina and Wangchuk, heads of state/government of all seven member states addressed the opening ceremony of the summit today. Myanmar President Win Myint, Sri Lankan President Maithripala Sirisena, and Prime Minister of Thailand Prayut Chan-o-cha also spoke at the summit. Leaders from the member states had arrived in Kathmandu on Wednesday and Thursday respectively to participate in the seven-nation regional grouping that aims to act as a bridge between South Asian and Southeast Asian countries. The first BIMSTEC was held in Thailand in 1997, followed by India in 2008, Myanmar in 2014. Nepal currently chairs the regional grouping. The next BIMSTEC summit will be held in Sri Lanka.